Edition 9 of ‘The Handover’ now Live! The Theme this month is all about kids. 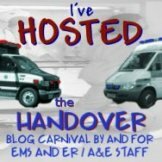 There is some harrowing and some inspiring tales to be found in this edition from bloggers across the EMS Blogosphere. Click here to head over and read through the posts for this month, but dont forget to keep an eye on Happy Medics blog for his call for submissions for next months edition, the theme of which is ‘A Close Call’. « A Flaw in EMS 2.0?